Detail of a photograph taken at Mathew Brady’s gallery in Washington, D.C., 1862. Courtesy Library of Congress. Abraham Lincoln came to understand that to achieve a lasting peace, slavery must end. He had always opposed slavery, but had never sided with abolitionists who called for its immediate end. 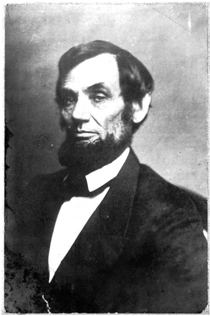 Lincoln had sought solutions that would make slavery gradually fade from white society—limit its location, sponsor compensation programs for slave owners, and relocate freed blacks outside the country. By mid-1862 Lincoln saw that a solution to slavery could not wait and that it had to address integrating freed African Americans into American society. That summer he began quietly to write the Emancipation Proclamation. "If Slavery is not wrong, nothing is wrong. I can not remember when I did not so think, and feel."